For me, every trek deep and high into the mountains is the trip of a lifetime.Trekking through insurmountable regions, breathtaking scenery and crazy cultures is what I yearn for! The memories of my first trek, however are those of my blisters, aching limbs and painful calves! But today I am some 20 treks old and I know exactly on how to begin! Considering you’re going to be walking for long hours each day, carrying your backpack and may be some equipment also. This requires endurance fitness and Endurance wasn’t built overnight. It increases with experience, so the more endurance-type activities you can do; the better your body and mind will be able to handle it. So here’s something I highly recommend as an avid trekker you do before you embark on the journey. 1. Walk Walk Walk – Start with simple walks. This sounds obvious but you’d be surprised how many people don’t do it. Start going for long walks thrice a week and gradually build it up to every day of the week. You should be able to walk 4-6 hours comfortably before you go. 2. Work those legs – Any leg based cardio will also help hugely. Pep up your cardio workout at least two months before your trek. Playing a sport outdoors is ideal but the weather and your schedule may not permit you to do so. Sports like outdoor cycling, basket ball, tennis would be just ideal. And if you’re a gym junkie, mix up some high intensity leg based cardio like cycling, kick-boxing, combat with squats, lunges, dead lifts and calf raises. 3. Don’t just stare at those stairs – If your building has an elevator, skip taking that and take the stairs instead. Run up and down a few times during the day. Incidental exercise helps BIG! Stair climbing is a good way of building calves and quads. Add weights to your ankles for kicking in more stamina. 4. Train with a backpack: You will be carrying a backpack on the trek with your basics – rain gear, water, snack, camera etc. So when youre training, carry your backpack along. Make it challenging. If you really want to push it, try making your back pack heavier than you’re planning on the trek. 5. Running, Swimming or Cycling: Running at a steady pace for 30-40 minutes twice a week will help in aerobic conditioning. Swimming or cycling once a week for the same duration is a great idea too. 6. Hydration: The importance of Hydration in high altitudes cannot be undermined. Electrolytes are essential to keep you well hydrated. You need to replenish the necessary salts that you are losing on the trail. Nuts, chocolate and energy bars, oats, fruits and vegetable are all great sources of energy, protein and fiber. During your training, make sure to eat ‘on the go” so your body gets used it digesting while on the move or during strenuous exercise. 7. Footwear is key: Underestimate your feet at your own risk. Invest in a good pair of hiking boots. Ensure they are water-proof (not just resistant), have enough cushioning and ventilation. The other important thing is to break into them well before your trek. Start wearing them for your walks, to the gym for your training to avoid any blisters or discomfort of donning a brand new pair on your trek. Aching quads, screaming calves – they all qualify for that sweet sweat you just earned! But the price is nothing you pay to get out of your comfort zone and step into unexplored and pristine pastures! The best way to enjoy this package is by taking your fitness training for trekking seriously! Reeti is an incorrigible, avid trekker, marathon runner and a fitness freak. 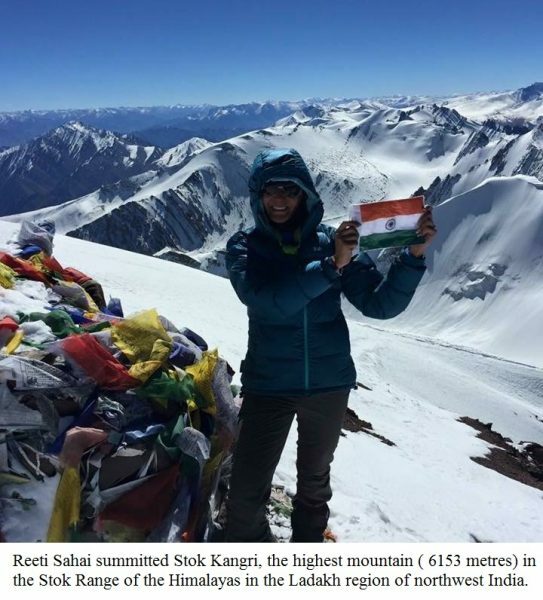 She summited Stok Kangri last year and has not looked back ever since. She is on to some very high altitude climbs this year.